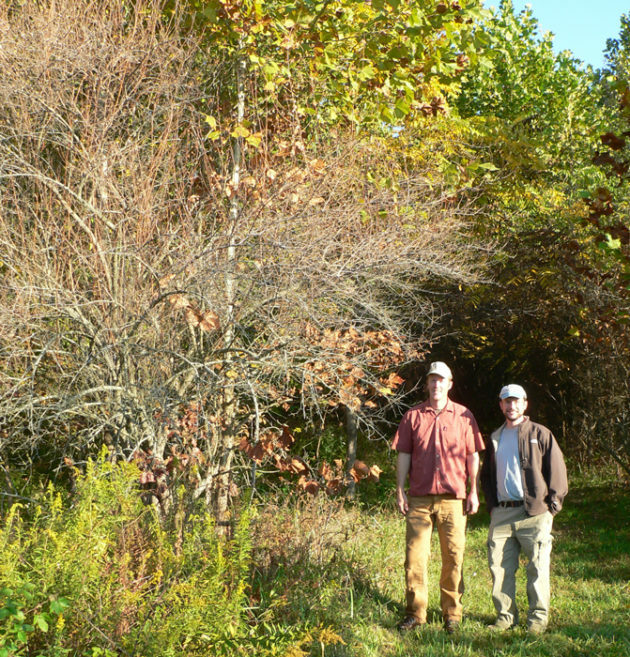 Sycamore Land Trust has grown tremendously over the past few years as we have focused on buying land while continuing to work with landowners to either donate their properties or enter into conservation easements. We now protect more than 9,000 acres in over 90 properties, and are investors in an additional 10,000 acres of nature preserves. Last year, we added land worth over $2.2 million. Sycamore protects more land than any of Indiana’s other regional land trusts. for HS to do three years of invasives eradication at TTE. But what do we mean when we say that we protect land? Acquiring new land parcels is hugely important, but another component of conservation is taking care of the land that we own. We’ve been entrusted with caring for the land, and that care we call stewardship. With input from the science advisors and natural resource professionals on our Stewardship Committee, we try to determine what the land “wants” to be and how to help get it there. We try to help nature take its course and to ensure success based on how the land would have looked if it had never been altered by humans. This is one of the reasons we do not allow commercial timbering on the land we own. Ongoing activities often include planting trees, eliminating invasive plants, and removing structures or refuse. On land for which we hold conservation easements but do not own, we visit and monitor the properties to ensure that the conservation easement requirements are enforced. Another part of land management is deciding which properties should be made into public preserves so they can be enjoyed for healthy recreation and educational purposes. We have 48 nature preserves, of which 15 have trails and parking areas. Sixteen are less accessible but still have visitors. At selected preserves, we also build viewing platforms and install interpretive signage, in order to encourage responsible use without damaging the conservation value of the land. Each year, thousands of people visit our preserves, often on Sycamore-led hikes and environmental education programs we host for children and adults. Connecting people to the beauty of nature is paramount to achieving our mission, because as more people grasp the value of this land, the more land we can save. Helping the land become what it wants to be has been the goal at the Touch the Earth Natural Area (TTE) just west of Columbus near SR 46. At 98 acres, it is larger than any park in Bartholomew County and is one of Sycamore’s first properties, purchased in 1995 and 1998. Two miles of mowed trails, bridges, benches, and an observation deck, along with a parking area, have made TTE an inviting place to enjoy nature for its neighbors and for many visitors from the surrounding area. Most of the Preserve is former farm land, which was cleared from native forest. Sycamore has planted hundreds of trees and has made a concerted effort to remove the invasive shrubs, such as autumn olive, that had taken over much of the preserve. Encouraging healthy habitat development, providing environmental education, and preserving natural spaces is critical to conserving the land we’ve been entrusted to protect. It takes the work of many people to make this possible, and we are so grateful to the donors and volunteers who share our vision of a cleaner, healthier environment in southern Indiana and beyond. You are the reason we can set our sights high!